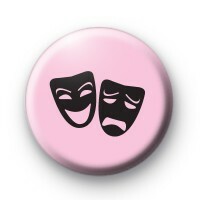 Cute Pink and Black badge with the iconic theatre happy & sad masks symbols which represent comedy/tragedy on stage. These 25mm badges are ideal for drama teachers to give out to their students and amateur dramatics (am dram) groups. Perfect for lovers of the arts & performances by Shakespeare as well as west end musicals, opera and ballet. Standard 25mm button badge handmade in the UK.